See, there’s this lawyer, we’ll call him Thad, and he’s throwing what appears to be quite the party. And he’s feeling puh-ritty good about it. Now, if there is one thing I have learned from watching (copious) Hallmark movies, it’s that making partner in your law firm requires a great deal of extracurricular rigamarole. Sometimes you have to invent an entire wife so that you’ll be taken seriously, because nothing stays stability quite like fast forwarding a courtship over the course of three days. And sometimes you have to throw a soiree to impress the founding partners. It’s a lot of pressure. Hanoi Rocks is here for you. While Thad works his way around the room, the guys from Hanoi Rocks, led by Razzle, get ready to save the day. 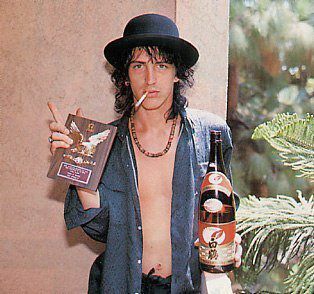 They are dressed in all their best outfits, and it becomes quickly and abundantly clear where Izzy Stradlin got his style from. The helicopter drops them off by a truck, which doesn’t make super sense in terms of transportation efficiency, but what do I know. In the back of the waiting truck is a band and their equipment. Were they just riding along until the truck stopped? Who is driving this truck? Regardless, they seem to be displaying quite a flagrant disregard for seat belts and a tremendous faith in the smoothness of driving on grass. The guys whisk the original band off to…somewhere. It’s kind of unclear but it all seems pretty innocuous, as far as rushing people offscreen goes. Back at the party, Thad’s getting for the highlight of the evening, the entertainment. Courtesy of a truck that just rolls up and is ready to go when a curtain is pulled. Because stomping a few divots in the morning will be well worth the impact of the music magically appearing! This will surely seal the deal. Why, Chadwick Harrington III hired this very same band when he was up for partner. And look at him now! But wait. Instead of a safe collection of middle-aged dudes ready to play a sizzling eleven-minute rendition of “Mack the Knife,” Michael Monroe saunters out, a vision in glitter and flowing scarves. The guitarist even makes an appearance via zipline playing a very electric, very unplugged guitar, which leads to my favorite thing in the fish-out-of-water video: covered ears and a square elaborately mouthing something like that’s awful. Thad is horrified and apologizing, but Mr. Sturbridge, one of the founding partners, loves it! And it’s not too long before everyone is dancing in their chairs and even Lowell in accounting is getting down. Thad is downright basking in the praise for being so forward-thinking and turning the boring, standard impress-the-founding-partners event into the bash of the century. Hands are in the air! People are diving into pools! Sparks are flying! Scarves for everyone! The helicopter arrives, knocking tables down and making the party even more decadently rock and roll. It’s a good thing it waited until everyone was happy and it was clear Thad had been successful, because he is definitely not going to get his deposit back on the rental furniture. And that’s it. On Monday there will be paperwork to process and Thad will have new responsibilities to shoulder and Michael will probably still washing the glitter from his hair and the original band will work on adding another minute to their version of “Mack the Knife,” but for now, all there is is happiness and joy. This firm is going to rise the helicopter-induced wind, go up around the bend, and take pleasure in rocking out to the 49th greatest rock anthem as determined by VH1.